VERIANOS Real Estate Aktiengesellschaft is a listed real estate investment and advisory firm and holding of the VERIANOS group. Shares are mainly traded at the open market segment of the Frankfurt stock exchange. Shares are also traded at the stock exchanges of Berlin, Stuttgart and Düsseldorf. 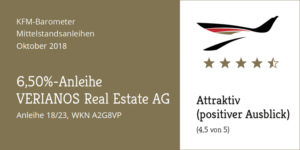 VERIANOS Real Estate Aktiengesellschaft is a listed investment and advisory company solely focused on real estate as an asset class. The primary listing of the share is at the Basic Board segment of the Frankfurt Stock Exchange (FWB). Secondary listings are at the stock exchanges of Berlin, Stuttgart and Dusseldorf. VERIANOS provides services for a broad range of clients, in particular institutional investors, family offices, fund management companies, financial institutions and property companies, with its two business units Investment and Advisory. With the business unit Investment VERIANOS acts as a principal investor or with joint venture and co-investment structures to acquire properties and property-backed assets and create value in complex situations. As an investment manager, VERIANOS sources, structures and executes single asset and portfolio transactions. A BaFin-registered capital management company, as a wholly owned subsidiary, develops and launches Alternative Investment Funds (AIFs) that it places with clients. The VERIANOS Advisory unit offers focused financial and consultancy services for selected clients. As a placement agent the firm supports fund management companies in the placement of investment products and raises equity and debt capital from institutional investors, banks and family offices. In addition, VERIANOS analyses, prepares, structures and executes real estate M&A transactions and develops individual and holistic property strategies at asset, portfolio and company levels. VERIANOS is an independent company, mainly owned by its staff and private shareholders with a long-term approach. End of financial year 31.12. The 6.5% Corporate Bond 2018 / 23 by VERIANOS Real Estate Aktiengesellschaft is an investment into a fixed coupon security. The capital raised with this bond will be used for entrepreneurial investment into residential property. The bond will be listed at the Frankfurt Stock Exchange (Frankfurter Wertpapierbörse, FWB) at the Open Market in the Quotation Board segment. The debt instruments are subject to the terms & conditions of Deutsche Börse AG and the EU Regulation on Market Abuse (MAR). The bonds can be traded at the Frankfurt exchange and through FWB’s electronic XETRA platform. In its recent Mittelstandsanleihen-Barometer report, KFM Deutsche Mittelstand AG upgrades the 6.50% VERIANOS corporate bond (ISIN: DE000A2G8VP3) to “attractive (positive outlook)“ with 4.5 out of 5 possible scoring points. KFM Deutsche Mittelstand AG is an expert for small and mid-cap corporate bonds and initiator of the Deutscher Mittelstandsanleihen FONDS (WKN A1W5T2, German small and mid-cap corporate bond fund). Here you will find our financial reports for download in the PDF format. Printed copies of the annual reports are available on request. As part of our sustainability approach we refrain from producing printed copies of the half year reports. VERIANOS Real Estate Aktiengesellschaft takes compliance seriously. The board unconditionally commits itself to compliance and has developed a comprehensive compliance management system ensuring that all activities of VERIANOS are always in accordance with legal rules as well as internal guidelines and regulations. At the same time responsible thinking and acting of staff are promoted and encouraged. The compliance management system is based on two pillars: prevention as well as investigation and reaction. Preventive measures are particularly regular training of all staff and a detailed compliance guideline which binds the board and all staff regardless of their position in the company hierarchy. The guideline details legal rules, defines internal standards of conduct and serves as an orientation for critical situations. It is intended to protect staff from violations of statutory rules and contractual obligations, to avoid conflicts between business and private interests and to protect the company from financial and reputational damage.